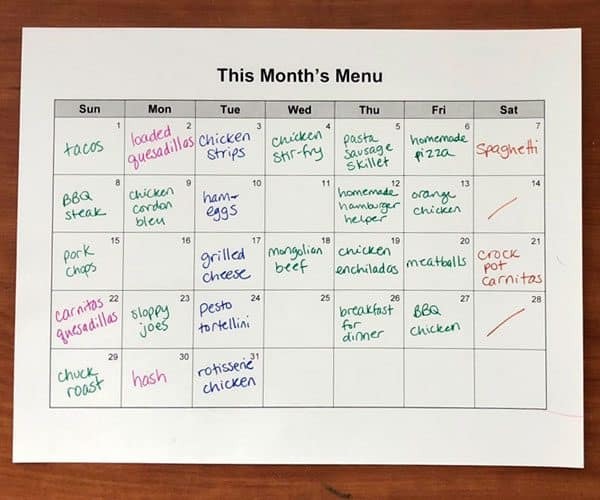 Making a menu plan or meal plan is a weekly chore that most of us dread. You have to look at the sales, decide what to make, think about what your family likes to eat, what you have time to prepare…yuck. 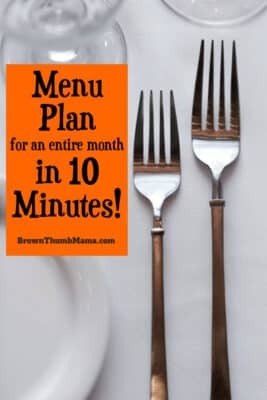 Believe it or not, you can make a menu plan for an entire month in 10 minutes! 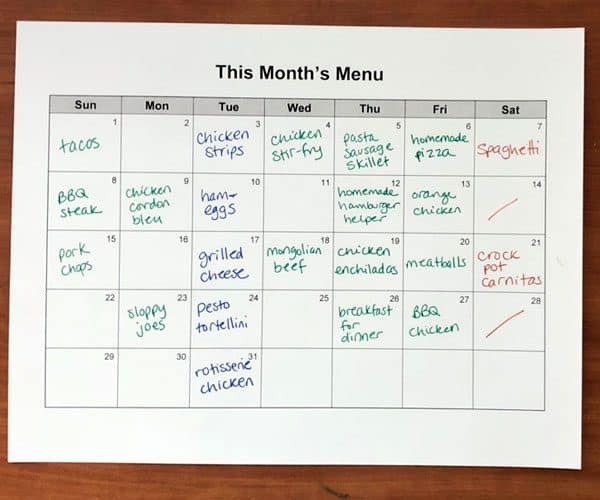 It is SO much easier to menu plan a month at a time. In fact, the prep work will probably take longer than the menu planning itself. Note: You’ll see that my menu plan doesn’t include side dishes. We are trying to eat low-carb, so I’m not making starchy foods like potatoes or rice. Instead our side dishes will be made with whatever vegetables are ripe in the garden, like Zucchini Fritters or steamed veggies. Now that you’ve assembled your lists, sit down with your calendar page. 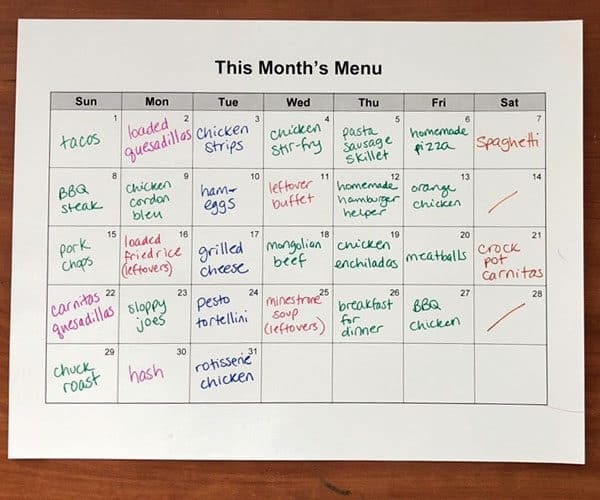 Cross out any days when you won’t be home for dinner, or are planning to eat out. Make a note of any days when you’ll have to eat quickly (we call this “Fast Pass”). For example, Hubby has music lessons on Tuesday night. We need to have a fast dinner after work so he can get back out the door for class. 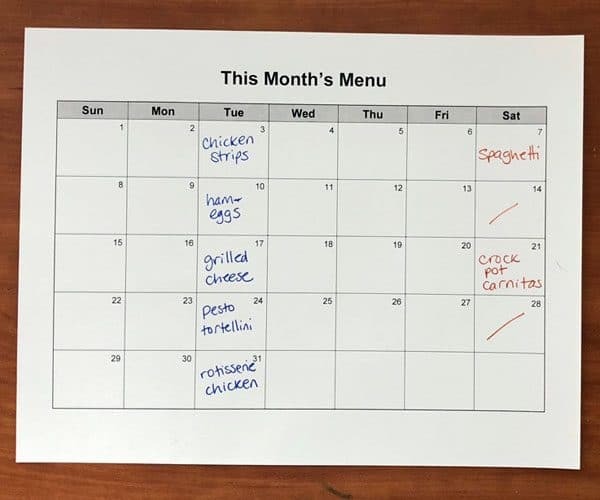 So Tuesday’s dinners will be quick and easy–things like chicken strips and salad, ham and eggs, etc. Enter your favorite quick and easy meals on your Fast Pass days. On Saturdays, we have Game Night with friends and take turns cooking. This means I have alternate Saturdays “off” from cooking, so I’ve crossed those days off. On the Saturdays when I cook, we have a big crowd–so easy, family-friendly meals are what I make. Cross out any days when you’ll be eating out with friends, going out for date night, etc. 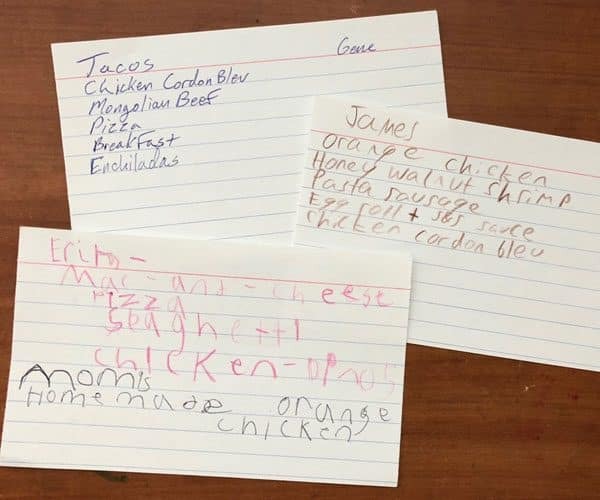 To get started on planning for the rest of the month, I asked everyone to write down their favorite meals on an index card. That helps me see what meals everybody loves (and which ones are conspicuously absent). Start by entering one favorite from each person per week. 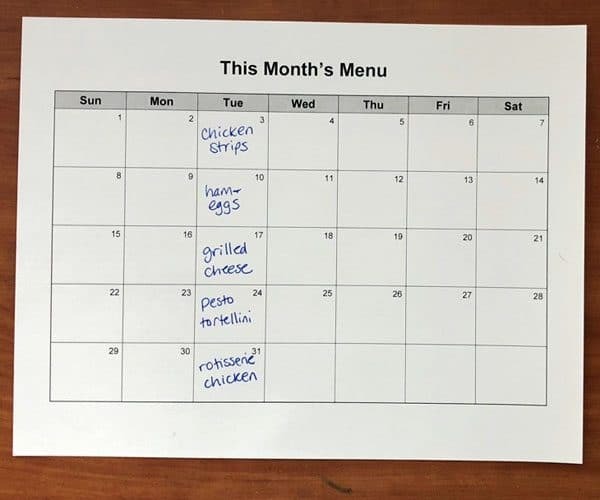 Mix up the meals so you aren’t having the same type of food several nights in a row (we could end up eating Chinese food every night if I didn’t watch for this). Everybody can see that one of their favorites is on the menu each week, and which day it’s being served. This means there are fewer complaints when a “non-favorite” is for dinner. Check that out! You’ve almost planned the entire month. Yippee! Next, look for bonus days. These are meals that you know will make enough for leftovers. Cook once and you have enough for two meals! Examples are Crock Pot Carnitas followed by carnitas quesadillas, or chuck roast followed by hash. Finally, plug in some days to eat up leftovers (we call these “buffet” days). If you have a little bit of beef and a little bit of chicken, chop them up and make Loaded Fried Rice. Leftover sausage and veggies? The Food Charlatan’s Minestrone Soup is a delicious recipe that uses both of those. Great job! 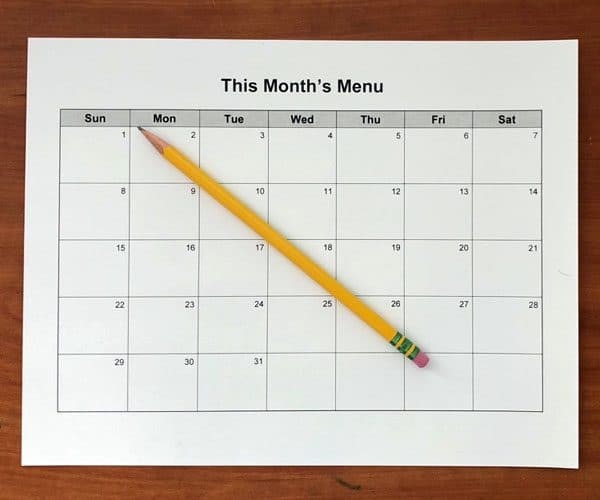 You’ve planned out your menu for the entire month. The great thing about this system is that it’s very flexible. If you have all of your meat for the month, then you can switch meals around in any way that you like. Don’t feel like chicken tonight? No problem! Thaw some hamburger for spaghetti instead. Unexpected company? You don’t need to rush to the store–just make two main dishes. Honey-Garlic Chicken and Beef & Broccoli go great together. What are your menu planning tips and secrets? Share in the comments!